Rabbi Rachael Jackson was ordained in 2015 and was thrilled to become a part of this community which prides itself on being engaging and welcoming. With a passion for teaching, learning, pastoral care, and social justice, Rabbi Jackson knows that Agudas Israel is a great shidduch (match). She understands the importance of all aspects of synagogue life and the role of lay leadership, for prior to rabbinical school, Rabbi Jackson worked for biopharmaceutical, biofuel, and hazardous waste companies in Colorado as an analytical chemist. During this time, she also volunteered at Congregation Har HaShem in Boulder, CO where she sat on the Board and Executive Committee, led services, founded the 20s/30s group, and taught Torah study. It was at Har HaShem that she truly fell in love with Judaism and the beauty of congregational life, which inspired her to change careers and enter rabbinical school at Hebrew Union College-Jewish Institute of Religion (HUC-JIR). While at HUC-JIR, Rabbi Jackson served student congregations in Portsmouth OH, Marion OH, Columbus IN, and Fairbanks AK. In addition to experience gained in these congregations, she was also a Fellow at the Cincinnati Jewish Community Center. While there, one of the programs she created and spearheaded was “Experiments with a Message,” directed to preschoolers, using science experiments as a way to teach Jewish values. An important facet of Rabbi Jackson’s rabbinate is to seamlessly meld Judaism and modernity, to integrate natural law and Jewish living. 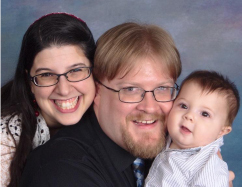 Rabbi Jackson is married to Danyul, and they are excited to be at Agudas Israel along with their young son Adrian.